On Saturday, Jan. 12, the annual Mass and award ceremony for parish religious education programs was celebrated at the Cathedral Basilica of SS. Peter and Paul with Bishop Michael Fitzgerald as presider. 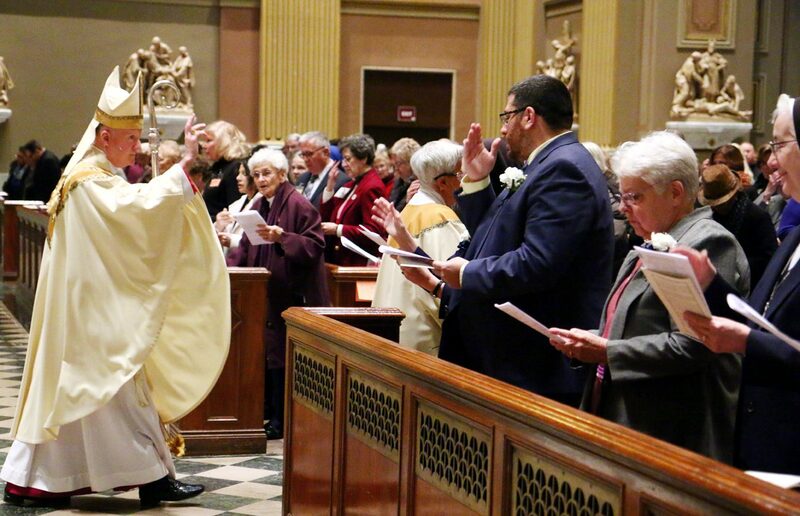 At the ceremony 215 lay catechists were honored for their years of service in their parishes ranging from five years to 40 years, as well as seven religious sisters and lay directors of religious education. The Gospel for the day had special significance in that it focused on St. John the Baptist. “He knew the Lord, he loved the Lord and he brought others to the Lord,” Bishop Fitzgerald said, holding John up as an example for the catechists. Clearly the catechists are doing just that. For example, Bill Fucich of Our Lady of Good Counsel Parish in Southampton and a recipient of the Martin de Porres Award for 20 years’ service, recalled how he started. Carol Kelly of St. Dorothy Parish in Drexel Hill received the St. John Neumann Award for five years’ service as a catechist. She credits Sister Alice Gray, R.S.M., (see our Profile story) for getting her involved. “My children went through her program and I just wanted to give back now that I have the time,” she said. In addition to the awardees the cathedral was filled with supporters and well-wishers. Sister Mary Ellen Kennedy, I.H.M., was there for Sisters Kathleen Fitzpatrick and Sister Helene Thomas Connolly, who received awards as DREs (director of religious education). Sister of St. Joseph Catherine Gerald Kelly, the director of mission for her congregation, was there to see Sister Margaret Jude Sullivan receive an award. “Our sisters had a great love for the children in the elementary schools and this is a way for them to consider that ministry,” she said, noting many of the former school teachers are now in parish religious education ministry. But of course, most of the awardees were lay men and women. Another example was 20-year man Joe Dagney of Our Lady of Consolation Parish, Parkesburg. He has taught high school, middle school and confirmation classes. He believes his work as a catechist has helped him at least as much as it helped the children. “This has changed my life. It has made me a better father, a better husband and a better worker. It has been a blessing,” he said. Religious education classes certainly have been a blessing for the archdiocese also. Once something of a stepchild in parish ministry they have become extremely important if underappreciated. According to archdiocesan figures there are now more Catholic children in parish religious education classes than there are in parish and regional Catholic elementary schools. The catechists and DREs deserve every award they get. God bless them. Interestingly, the awardees at the Mass and ceremony represented just a little under 30 percent of the parishes in the archdiocese. If all the parishes submitted the names of their eligible teachers, the annual Mass would need a lot bigger venue than the cathedral. St. Katharine Drexel Award (10 years): Mark Gonzalez; Sister Margaret Jude Sullivan, S.S.J. ; Sister Kathleen Fitzpatrick, I.H.M. St. Oscar Romero Award (35 years): New award this year — Sister Alice Gray, R.S.M., is the first to reach this level. Paul VI Award, the highest archdiocesan catechetical award: Father Christopher M. Walsh, pastor of St. Raymond of Penafort Parish, Philadelphia.